So thankful the Father in heaven doesn’t stand in heaven and look at us and say,” Because I said so.” But in a sense, He spoke it and came to be, and it was. He is the Creator of all and sustains the galaxy and He is the absolute One in control over the universe. What He said came to be which is unimaginable. There is no force which is out of His control and power. Imagine God who is above the power of gravity. Why then is the human heart out of control? Why could God not speak, and we do? One of the greatest things God has given us is a will. Again, inconceivable love of God invades when man was created. We are at our best when our will lives under what God speaks. He could have commanded us to obey, but it is His love which leads us to a place of obedience. We reveal our love for God when we chose to obey His Words. What command is God giving us to obey? 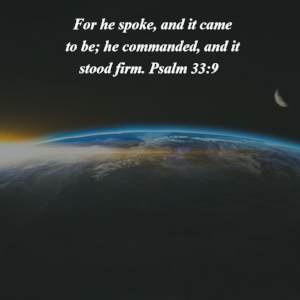 What words are God speaking and drawing us near? Right where you are show God you love Him.